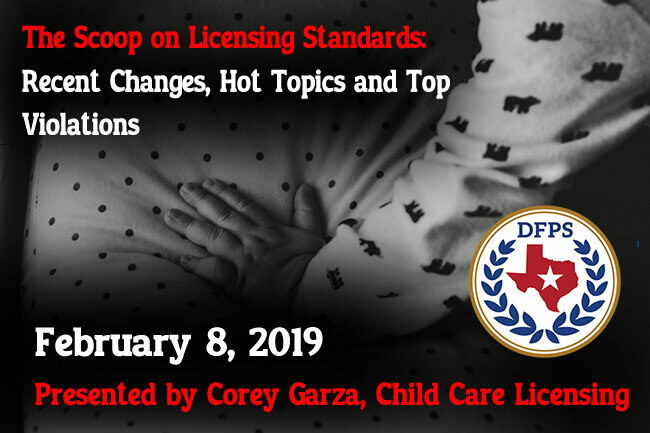 Join seasoned Child Care Licensing specialist and trainer Corey Garza to get the “hot off the press” details regarding new changes to Minimum Standards! learn what they are, how to comply with them and how to ensure your facility meets the required changes. Additionally, Corey will discuss the most common violations in licensed facilities, as well as share an array of other important topics related to child care and the Texas Department of Family and Protective Services. This is a training you DON’T WANT TO MISS if you are an owner or director/assistant director of a licensed child care program!